Special to the DailyRyan and Trista Sutter are ready to trade their Wildridge residence for something new. As reality would have it, Trista’s not pregnant – yet.Although, with plans to start a family in the very near future, Vail’s most acclaimed sweethearts, Ryan and Trista Sutter, are ready to trade in their luxurious upvalley pad for a house with a yard and a fence.The couple put their Wildridge residence on the market at the end of August. But they’re not moving far – just down the valley. “We want to move to Eagle,” Trista says. “We want a family. The community is great. The schools are wonderful down there. We want our own yard. We would be able to put up a fence there for our dogs. There’s room to grow.”It’s been two years since Ryan Sutter and Trista Rehn met on “The Bachelorette” and said “I do” as thousands witnessed the million-dollar ceremony from home on their TV screens. Trista had been living in L.A. at the time and Ryan in Vail when the couple decided to settle down in Wildridge. Nothing has changed, other than Trista’s appreciation of the Vail Valley. Once they settled in, Trista discovered the house was perfect for the newlyweds.”The master bath is wonderful. It’s got separate vanities, which is key to a successful marriage,” Trista says laughing. “And another key, which we will have to do without in the new house and now that we’ve been married two years we can deal with this, but we have separate closets in our house now. I have a huge, gigantic walk-in closet that I love, and Ryan has his, you know, normal-sized closet. But the fact that we have his and her closets – so key.”The house doesn’t come without special touches compliments of Ryan and Trista either. Ryan built a work bench and island in the oversized garage, not to mention the hours upon hours he’s spent landscaping and planting flowers. 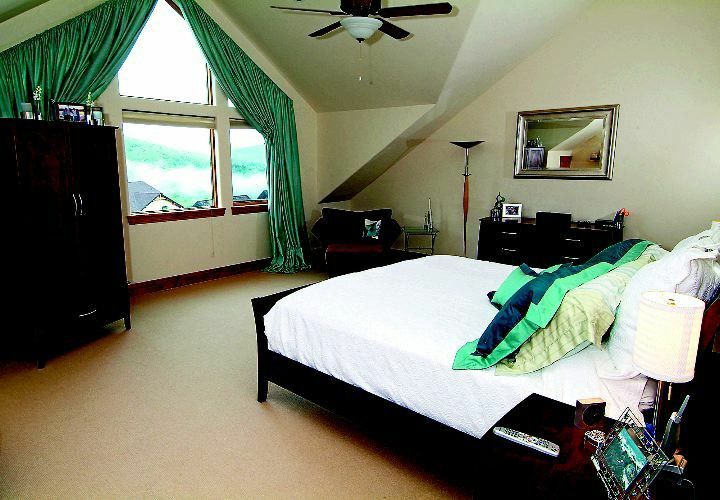 Trista’s passionately decorated each room according to their personalities – hearts for Trista and snowboards for Ryan. US Weekly remodeled the backyard patio and the washer and dryer was a gift from Ellen DeGeneres. For more information, call Heather Lemon at 479-2020 or e-mail hleamon@slifer.net.